Telehealth continues to offer tremendous potential to transform the healthcare delivery system by overcoming geographical distance, enhancing access to care, and building efficiencies. But online telehealth services on their own fall short of enabling true patient engagement and providing patients with the best possible care. When combined with tailored self-help and interventions, and the ability to capture and record data at the point of care, telehealth solutions become a true asset for healthcare organizations looking to take patient engagement to the next level. These activities are especially useful in communities where access to appropriate healthcare services is limited. Compared to residents of urban communities, residents of rural and frontier communities are more likely to be older and to have more risk factors associated with their health conditions. Under longterm post-acute settings, telehealth can provide needed services across home and community-based settings, schools, hospitals, office-based settings, and community health centers. The use of telehealth for chronic disease care management has been associated with reductions in hospitalizations, readmissions, and lengths of stay, as well as improvements in some behavioral health physiologic outcomes. Telehealth will play an increasingly more important role in care delivery. For example, in a 2014 study, Towers Watson concluded that telehealth had the potential to generate $6 billion in annual healthcare cost savings for US employers. So, with all the benefits of telehealth, how do you take it to the next level of patient engagement? Personalization of care and interventions is the foundation of complex care delivery. Complex care patients require varying levels of care across many providers that require data-driven coordination and connectivity. Making care accessible and personal to an individual’s treatment plan while staying connected to their care teams ensures proactive care and support. Data from individuals, care teams, wearables, and clinical and mobile devices provide a holistic picture of both physical and behavioral health – data that can be used by the provider to refine care plans and demonstrate outcomes and compliance. Predictive analytics can help identify and prevent avoidable episodes that could result in costly hospitalization and interventions. So, while telehealth can overcome geographical distances, enhance care, and build efficiencies, its true potential is revealed with full integration inside a digital platform. 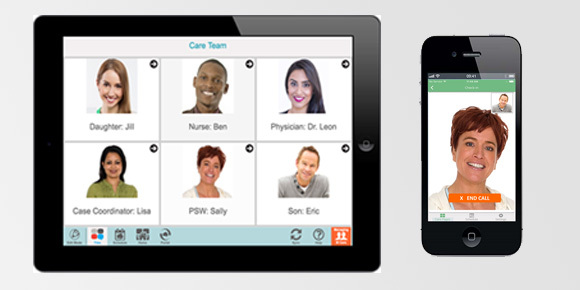 A fully integrated solution not only enables care teams to stay connected to their patients through secure telehealth technology (video calls, voice calls and instant messaging) easily through mobile devices, but it also means a platform that supports engaging patient experiences through personalized care plans and content with point-of-care data collection that can be used for patient monitoring and proactive care. What do the features of a fully integrated telehealth solution look like? Device Agnostic: available on supported iPhone and Android smartphones and tablets including Android, iPads and Windows devices. With full integration inside a digital platform, the advantages of telehealth are amplified by supporting an even stronger patient engagement experience. Healthcare professionals can capture valuable data from the point of care and make scheduled appointments more meaningful and effective. Learn more about implementing a full digital health solution inside your organization that includes a telehealth component that can let you flex your digital muscles.